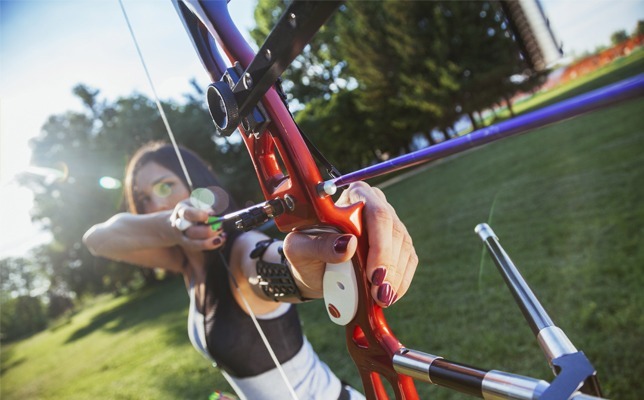 Archery, like any other sport, can involve a large range of equipment and accessories. However, to get started all you really need are the basics: a bow, a string, some arrows, a bracer, finger tab, a quiver, a bow stand, a bow stringer and a target to shoot at. There are three main types of bow shot in the UK today – recurve, compound and longbow. Nearly all beginners will start with a recurve bow, which is the easiest on which to learn. Recurves get their name because the ends of the bow curve away from the archer. They can be left-handed or right-handed to suit the individual, and have an arrow rest that the arrows sits on. A bracer is used to keep loose clothing from getting in the way of the string, and to stop the string hitting the arm, which could cause bruising. It is fitted to the inside of the arm holding the bow, between the elbow joint and the wrist. The widest end of the bracer fits closest to the elbow. A quiver is simply a device designed to hold an archer’s arrows. A side quiver is attached to a belt and worn around the waist, while a ground quiver is placed on or into the ground to hold arrows next to the archer. Some ground quivers can also hold bows when they’re not in use. A simple support used to hold a bow off the ground when it’s not being shot. A tab provides protection for the fingers which draw the string. For a close and comfortable fit they are secured over the archer’s fingers, and some models can be adjusted to the size of your hand. A bow stringer is used to string and unstring a bow. For your own safety it is always best to learn to do this under the guidance of an experienced archer or coach. A target is comprised of three parts: a target face, usually made of reinforced paper; a boss, made from tightly packed rubber or straw which stops the arrows safely; and a stand, which holds the boss and target face in place. An arrow rest is a simple device that fits to the riser of the bow to support an arrow while it is being shot. It is designed to hold the arrow in the correct position, and is flexible enough not to interfere with the arrow as it begins its flight. Arrow rests are available for left- and right-handed bows. Arrows can be wooden, aluminium, carbon, or a carbon/aluminium combination. Choosing the right arrow stiffness and length for you is vital. You must never use an arrow that is too short because, when you draw it, there is a risk it can fall off the arrow rest and damage the bow or, worse, damage you. Shaft: This is the main body of the arrow, and can be solid wood, or an aluminium or carbon tube. Nock: The nock is the groove at the end of an arrow that clips onto the bow string. Fletchings: These plastic or feather attachments are secured to the back of the arrow shaft, and they help to provide stability during the arrow’s flight. Pile: The pile is simply the point of the arrow. They are often made of a heavier metal than the shaft to help the arrow fly straight. Very good, amazing, superb ??? ?